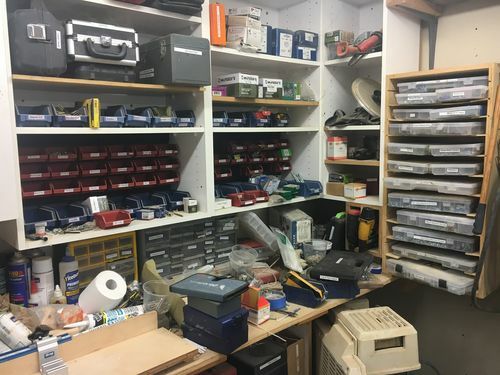 Here’s a couple of photos from my shop in the corner where I store screws, nails and other small parts. You will notice that this is a candid photo, and I didn’t spend time cleaning up or asking the shop to smile. What works great: Most all items are labeled. I have a lot more that needs to be sorted and made accessible. 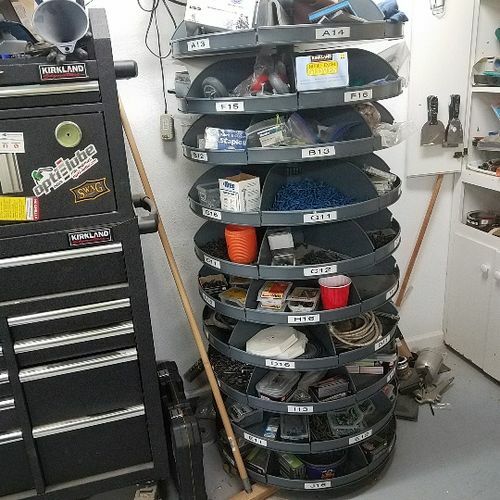 Interested in pictures from your shop, and any ideas for storing lots of small parts and being able to find them when needed. Thanks. 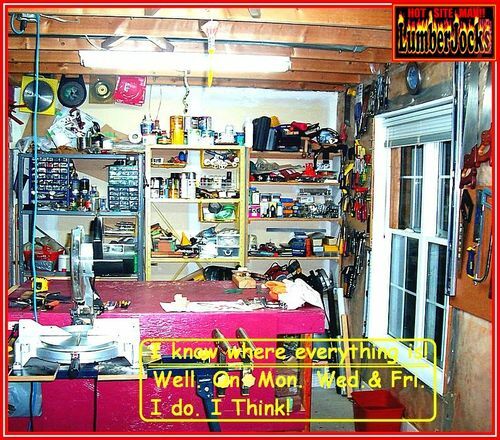 Note: I worked as a cabinet maker and a general contractor, and I sure have a lot of items to keep track of. These plastic storage containers are easy to grab when I go out on the road. I tracked down some of the bins that the Ace hardware uses for screws, bolts ect. Found a whole gaggle of them for cheap on craigslist, relabeled them and walla, awesome organizers, I made the labels large enough i can see without me glasses. 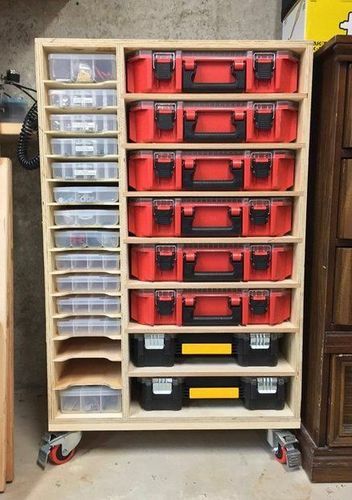 or make some bins, I like the hardware bins, as i can pull the whole bin/drawer and take to the work area with a selection of sizes. and nails of different sizes scattered all over the place. job site. 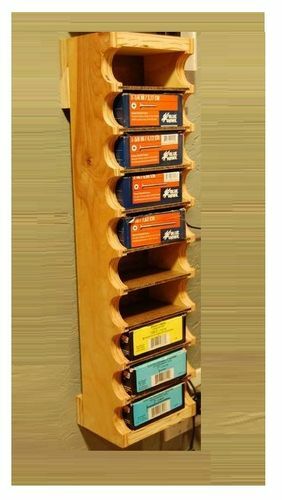 It will accommodate the standard one pound boxes of nails and screws. found on the home renovation job sites. What I use may be the same thing that Knockonit uses ,I have these bins all over the shop in different sizes from large bids that can hold 6” lag bolts to small ones that you can hold screws that would go into a watch, it’s easy to get either a part at a time or the whole bin, being made out clear plastic you can easily see whats inside.I don’t use this brand but here’s a link for the type of bins I use. So the photo isn’t of something you built, but something you plan to build? I’m planning to add more storage in the same space by attaching the bins to a pice of plywood and then attach the plywood to the cabinet with some sort of hinge. This will allow me to double up on the number of parts stored in the same space, with the most used fasteners in front, and the least used parts on the back side of the plywood. Over the years, it amazes me how hard it is to keep things organized. I didn’t include any other hardware than bolt, nuts and wood screws but it has been a major step saver so far. That’s a great cabinet. I like how the boxes are on slides. Mine is so junked up I’d be ashamed to show it. 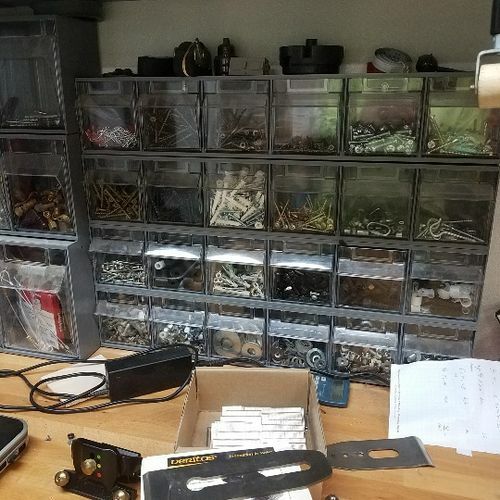 I’m not good at organizing my fastener, or anything else. I do have the harbor frieght rolling stand with bins on both sides. I’m probably the ONLY Guy on here that does that! ...lol… Did somebody just say something? lol, i have my daughter coming over to show me how to post pics today or tomorrow and i’ll get some pics up. essentially what i found was bins that the ace hardware stores use for their bolts and nuts ect. 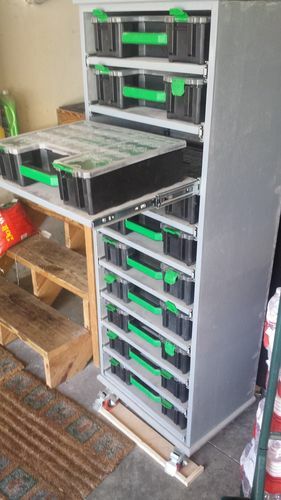 they have 4 drawers per unit unit is metal approximate 16×16x16, four bins, with dividers, nice big label area, i bought a hundred of the bins, have about 12 in shop, in different locations, still doesn’t help with my clutter, i’m a slob, got stuff every where, i just can’t seem to keep putting stuff where it belongs, until i need a spot to assemble or work on something, then its clean up time organize time, which takes away from project time, jeebus, sure wished i’d do it as i finish one project up. 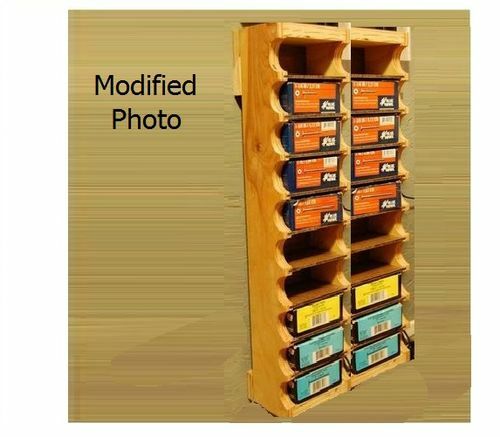 My first real project when I started setting up my shop when I retired was to make a pair of octagon storage bins inspired by antique hardware store bins that spin on a lazy susan. I initially planned to make a single tower but decided part way through to divide it into 2 shorter ones that I can put on a shelf instead of being free standing. I also made 2 of the drawers double width to accommodate some larger items so instead of 88 bins there are only 86. 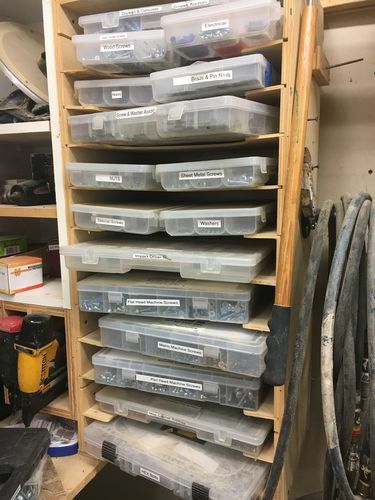 The triangular bins are handy to take over to my work bench and overall this makes for fairly compact way of storing screws, nuts and bolts. This was a blast to design and build. you like with an airtight lid to keep the moisture out and prevent rusting. or make a double or triple unit if you so desire. I don’t know why the original fabricator didn’t route the edges for that nice finished look. also – hardwood sides would give a much neater appearance. (this project is limited only to your imagination). and that is way out of my “needs” bracket. 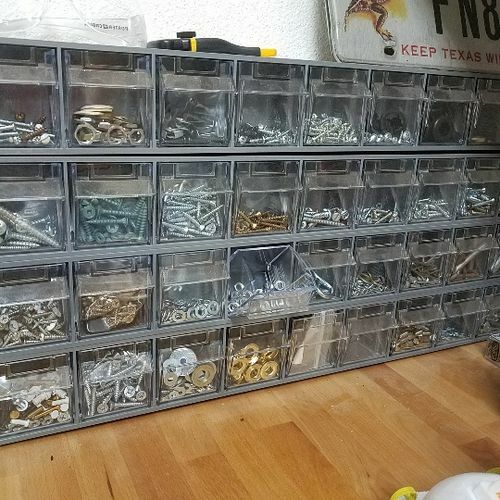 I now keep one for exterior screws and one large one for most cabinet making hardware..
Got the rotating bins from an auction and the clear plastic small parts bins from eBay. I like to be able to see what I’ve got before starting looking. 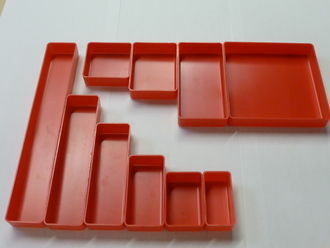 I have been using small containers from Schaller Corporation because they have so many different sizes available for storing almost any parts from very small to larger parts and are fairly inexpensive. Below is a sample of some of the sizes. Different depths are also available and can also be purchased on Amazon and eBay.